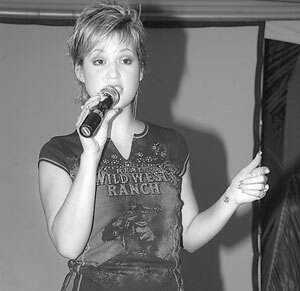 Singer Tami Chynn has signed a four-album deal with music giant Universal Records. The signing took place early last week, after some two weeks of negotiations. Chynn, who is managed by Spin City Entertainment, says she hoped that her signing with the overseas label would open the doors for other female Jamaican artists. “I am overwhelmed, and I feel just great. It’s like we have accomplished a part of the dream. This is definitely a step in the right direction,” Chynn said. “The company (Universal) saw the potential and decided to work with me. The negotiations went on for a couple of weeks with the company. I had offers from other companies but for me this was the best offer and I thank God for this opportunity,” Chynn said. In a statement issued by Universal, senior vice president of A&R Jolene Cherry said: “Following his trip to Jamaica, music executive Arron Jachoves introduced me to the music and talents of Tami Chynn. We invited her to travel to Los Angeles to perform for our team. Instantly I knew she was great. My team was equally ecstatic about her talent following the showcase. Cherry in the statement also stated that Universal music group chairman, Doug Morris, expressed an interest in the young talent, flying her to New York on his private jet to perform for the team on the east coast and special guest Chris Blackwell. Jerome Hamilton, Chynn’s booking agent and publicist at Headline Entertainment was happy for Chynn and the possibilities her signing for Universal can have on the local music industry. “This is another excellent opportunity of Jamaican music to make a mark on the international scene. This puts us in a position of influence and is really an exciting time,” Hamilton said. Born into a musical family, Tami’s entry into the music world was inevitable. Her sister Tessan caused some sparks to fly as lead singer of Mile High. Her mother Christine was in a group called Carnation and her father Richard is a musician who plays drums and the guitar. “I grew up surrounded by music. I was in the Little People & Teen Players. My mother got us involved in the performing arts pretty early,” Tami said. Her experience with Little People & Teen Players has paid off as it has helped in preparing her for the big league. “The experience I gained is now vital to what I am now doing. It definitely helped to hone my craft,” she said. Rock You and the Renaissance label-produced Hyperventilated are among Tami’s more familiar recordings which have been staples on radio and in the dancehalls. “The work and the preparation is now on. This is just a foot through the door. I hope to use this to make new waves for Jamaican music and for our culture,” she said. Chynn has already started work on her debut album. The set was already in production prior to her signing with Universal. “I am taking some care and time to complete the album. I want it to be a wonderful album coming out of Jamaica that Jamaicans can be proud of,” Chynn said. The Universal Music Group has had a long association with reggae and dancehall music over the years. International deejay Shaggy is signed to the Geffen imprint which is owned by Universal. The compilation/catalogue arm Hip-O-Records which has released compilations from Capleton, Buju Banton and others over the past few years, is also owned by Universal.